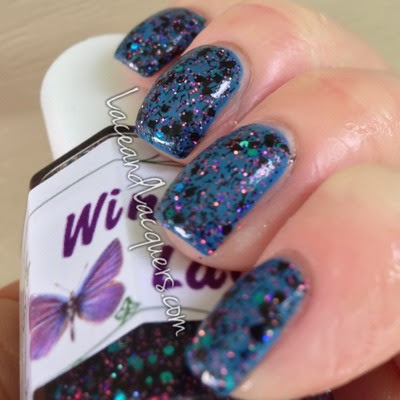 I'd like to make a note before you read my review: Crystal mentioned her note to me that she likes her polishes fairly thick, and that most people would prefer to add thinner over buying a thinner polish. She mentioned she would also be adding this disclaimer in her shop so consumers are aware before purchasing the polishes. I personally am not a fan of thicker polishes, especially if I'm layering over a color (it tends to drag the color along with it making it look wrinkled). However, I did not add thinner to these polishes when I swatched them. 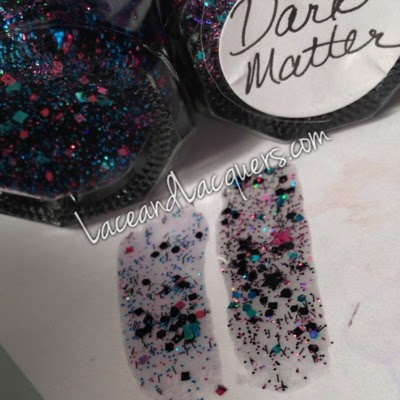 Dark Matter is "a mix of sizes and shapes of purple, black and teal glitter in a greyish jelly base. 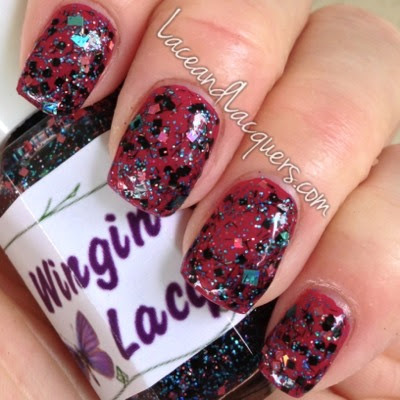 There are some [black] stars and holo purple [glitter]". While I don't find this to be the most unique, I do like how this polish has the ability to change nearly any color you layer it on top of. I really enjoy the purple holo glitter, it gives it that little somethin' extra it needed. I used 2 coats of Dark Matter over Sinful Colors Grecian Sun. While the formula was a tad thick, I didn't seem to have issues with it. With a thicker polish consistency, it is important to keep in mind how long you wait in between layers to avoid "slipping" of the other layers. I waited maybe a minute or 2 before I added the 2nd layer and everything was good to go. I'd also like to note I was unable to get any stars out of the bottle. I find this to be pretty similar to other yellow creme base polishes, very Easter and spring looking! 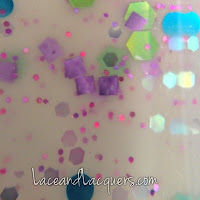 Butterfly Fields is a "creamy pale yellow with holographic lime hexes, purple dots and squares, teal dots, and pink hexes and dots. 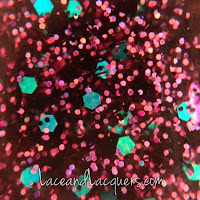 There are also holo pink butterflies". I think the holographic glitter really sets this one apart from the other pale yellow polishes I've seen before. I did 3 coats of Butterfly Fields, no undies. I would mind the dry time with this one as well. I find thicker creme finishes need more dry time allowed. Otherwise, no issues with this one! I think most of my butterflies were stuck at the bottom of the bottle haha I was okay with it because I'm not a fan of butterfly glitter :P Resting the bottle upside-down should help that issue (if you enjoy the butterfly glitter)! Bars AND squares? People know the way to my heart bahaha. 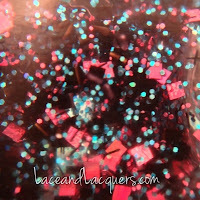 Dark Energy is a mix of sizes and shapes of teal, black and pink glitters". Mores specifically different sizes of hex, square and bar glitter. I did 2 coats over Revlon Plummy. I didn't have any issues with this one :] I, again, minded dry time between coats due to the formula's thickness. 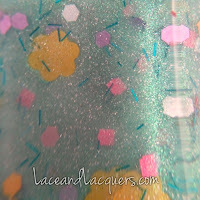 Spring Fever is a "shimmery aqua base with pink, teal, yellow and purple matte glitters of different sizes. There are several different colors of flower glitter". I feel when people make polishes, a shimmery aqua/mint color is the one they always try haha. Most of them I don't like, but I did enjoy the shimmery base of this polish! I also enjoyed the layering effect this polish has. 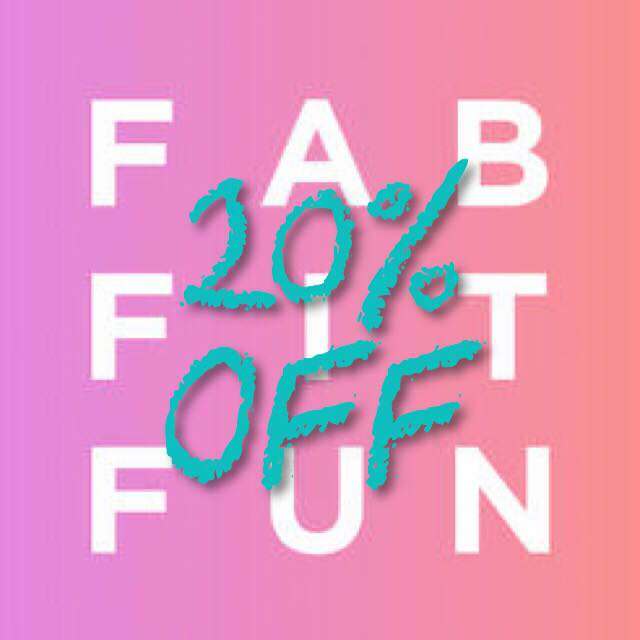 Stay tuned for part dos! those are some pretty colors.